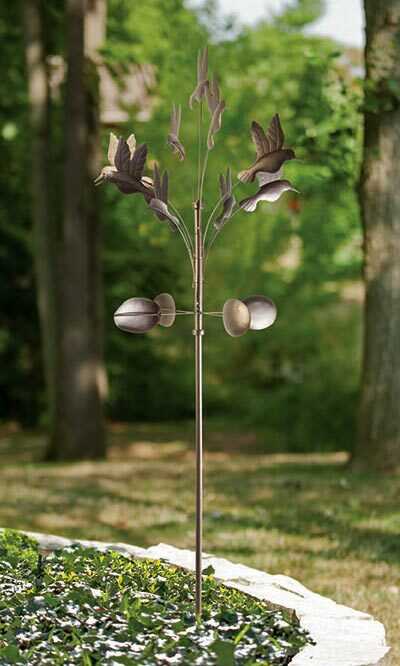 Create a birding theme in your landscaping in a fun new way with the Panacea Hummingbird Kinetic Art Windmill. A wealth of hummingbird shapes adorns the top of this unit, fanning outward from the top for a striking, tree-like effect. The top bird figure brings remarkable height to the unit, and the full topper turns in the wind for added drama. Four rounded, leaf shapes rest beneath the hummingbird accent, mimicking directionals on a weathervane. The bronze colored finish adds a natural touch to the unit, and its all metal construction makes it perfect for use outdoors. The generous, 66" tall shaft supports the intricate metal topper, and its 11" long, step-in base provides stability in your soil. Celebrate "flying jewels" in your backyard all year long using the Hummingbird Kinetic Art Windmill. Assembly required.